A brief history of the citizens advice bureaux and CAS. 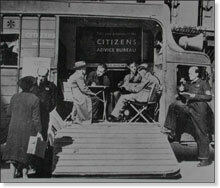 Citizens advice bureaux first appeared in 1939, when over 200 were established throughout the UK. Bureaux were all governed by a Central Committee in London. The first Scottish bureau was in Glasgow, but further bureaux opened in Edinburgh, Aberdeen and elsewhere soon afterwards. During the war, more than 60 bureaux operated all over Scotland. And then, as now, the great majority of bureau staff were volunteers. Bureaux were the UK government’s response to the public’s need for advice and information on all kinds of things. Many enquiries related to wartime issues, such as what to do after being bombed out, tracing relatives whose homes had been bombed and lost ration books. Other enquiries, though, related to income tax worries and employment issues. When the war ended, the kinds of queries faced by bureaux changed to meet the needs of a peacetime society that was slowly finding its feet. The CAB remained a familiar, independent place where people could turn for help – so they did, and bureaux continued to be part of the daily life of Scotland. Increasing concern was voiced throughout the 1960s and 70s that a London-based information service could not take sufficient account of Scotland's distinct legal and educational systems. So, in 1975, the regional office for Scotland – the Scottish Association of Citizens Advice Bureaux (SACAB) - became an autonomous umbrella organisation. SACAB became fully independent in 1980, and a charitable company limited by guarantee in 1984. In 1988, SACAB adopted a trading name of Citizens Advice Scotland (CAS) – and here we are! The Scottish CAB Service celebrated its 75th anniversary in 2014.